Two parts for the solar electric system for the second bike have arrived- the panel and the solar controller. They are both an improvement over the first bike, although still not what I think would be optimum. The bakfiets has 3 regular 12 volt panels in series to produce 36 volts, but for this bike I'm using one flexible 12 volt panel with a DC-DC voltage step up converter. It is frameless and glassless, and in this picture is draped over a piece of firewood to show how it bends. 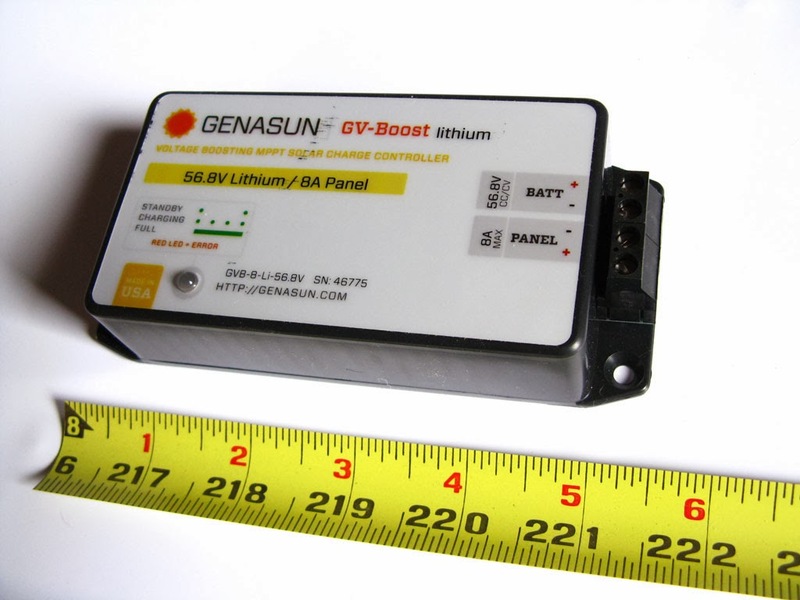 It has standard 12 volt PV panel output parameters, and I've checked the Open circuit voltage and Short circuit amps and found them both to be about 5% above the rated specs. It has good efficiency monocrystalline cells, embedded in a 1/16 inch thick layer of encapsulant that is between a white plastic backsheet, and a clear PET plastic (similar to beverage bottles) topsheet, (in place of the glass top of a regular panel). It has already started to scratch, so I'm not sure how efficient the cells will be in a few years, but the plastic itself should take many years to degrade. One nice feature that Grape has done is to put the electron collection grid traces on the backside of the cells, leaving the face clear of shadowing to improve the cell efficiency. The wiring junction box (thicker black section glued onto the center of panel) is the smallest I've seen on any panel, which is good for weight and size, but bad for wiring. The wires will need to face perpendicular to the panel edge and then run down the bike rack, so there will be some adapting required, the box is filled with sealant so this may end up just being a support for sharp radius bends on the wires. The panel weighs about 4 pounds. In comparison, each of the bakfiet's 20 watt regular framed panels weighs about 5.5 pounds, and the plywood lid holding them together is another 5 pounds, for a total of 22 pounds (for 60 watts of power). I expect to fit a frame to the new panel for attaching it to the bike rack, but it will still be a drastic improvement in weight and output. The new panel will hang out the back one to two feet, but the width is just about perfect as a cover for the luggage bags on each side of the longtail. The solar controller has an MPPT (Maximum Power Point Tracking) circuit that updates at 15 times a second, for panels that are on the move. (My solar controller at home updates once every 5 minutes.) It also has an output circuit that changes the panel's 12 volts up to the battery's 48 volts (both numbers are nominal), as well as a charging profile (CC-CV) meant for lithium batteries. The upper voltage set point is one volt low for my particular battery, but I don't think this will matter that much on the road. I would have preferred pigtail leads or a crimped terminal plug rather than a screw terminal block (on the right side of the housing). It's kind of old school, I used to fuss with them when I worked on 1960's Volkswagens. They are slightly susceptible to moisture, but mostly once in a great while they loosen up due to thermal cycling and/or mechanical vibration. 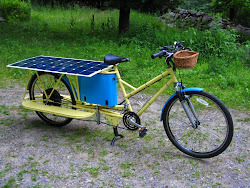 The panel and the controller were $300 each, which is twice the price of the solar setup on the bakfiets. 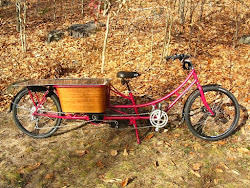 It does have 166% more output than the bakfiets, is much lighter, more efficient, and should provide much more energy. However I've been asking myself if it is worth it, and the best I can say is it depends. I don't think you can compare solar versus plugged in based on the LCOE (levelized cost of energy produced) versus grid price, as this is more of a usage defined comparison. If I was in an open terrain, doing longer distance riding, and plugging in was a challenge, it would definitely be good. But for short trips around town with a lot of shadows from buildings and trees it would be only a minor help, and a bigger battery would be a better option. From a historical viewpoint, my 22 year old home panels were $328 for 50 watts each. 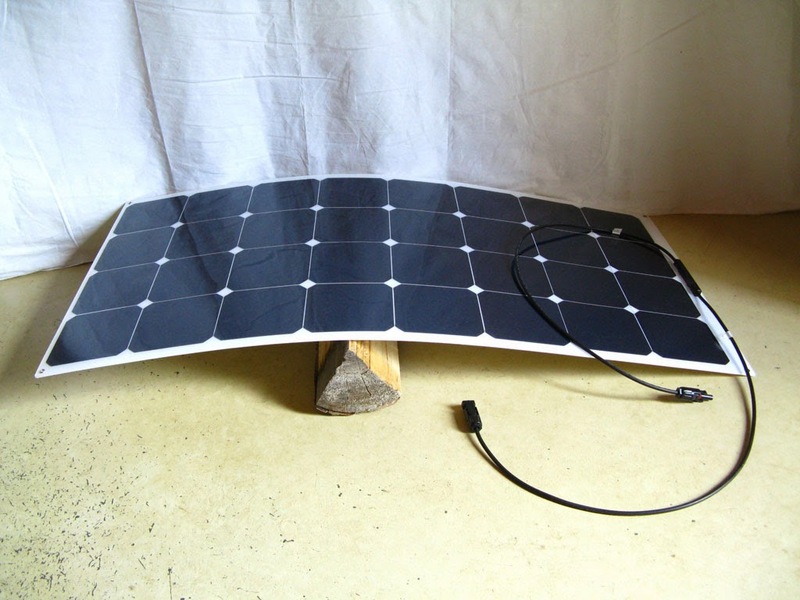 But then again, currently 100 watt panels with standard frames are now selling for $200. 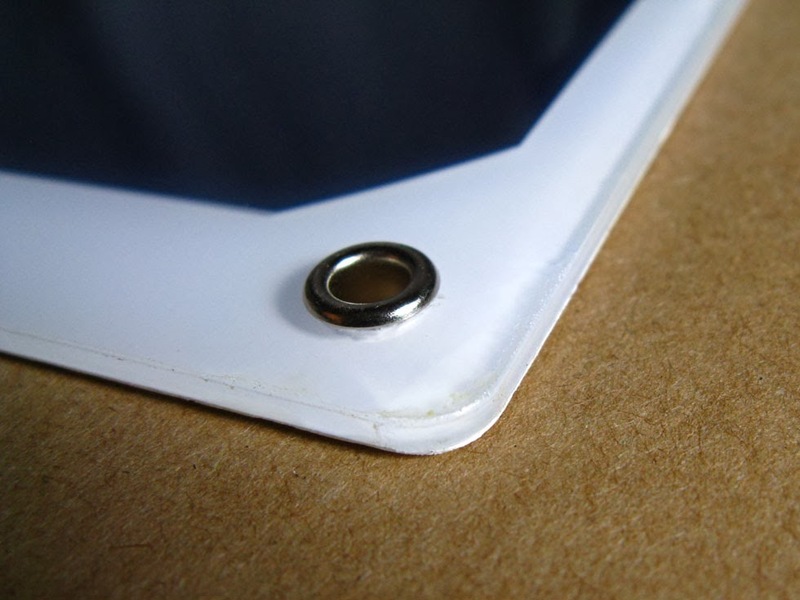 Assuming that the cost of the PET and glass frontsheets are similar, and the rest of the parts are the same, then a panel made without an aluminum frame should be less expensive. There is one very significant milestone for me about this panel- I bought it from Home Depot. I've been waiting 25 years to be able to go into a hardware store and buy solar equipment. From the viewpoint of selling bikes with PV, these prices are high. There are probably more than a few people that will be willing to spend this much for solar power, but not average riders. 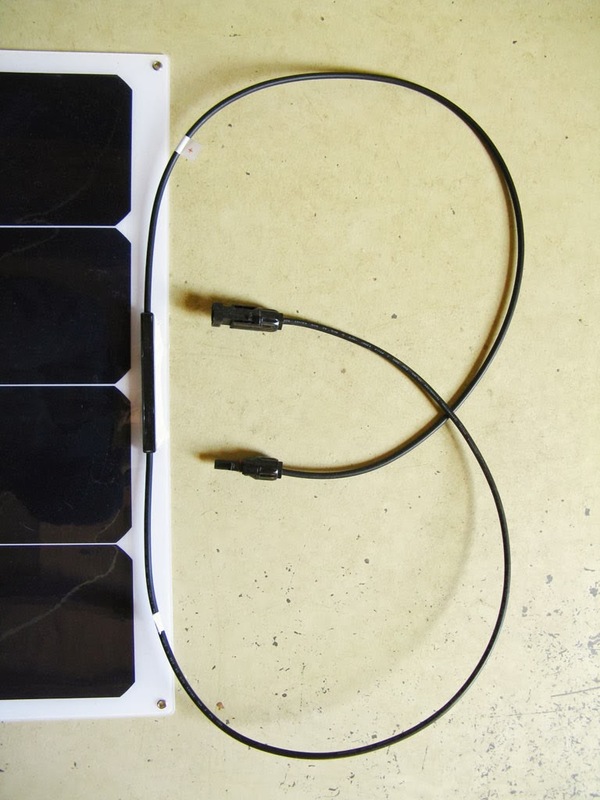 The panel price will probably drop over time, but the solar controller might have a problem. I still think running off the sun is a good idea, and have 3 more PV ideas I'd like to try out on the third bike which may change the controller issue for the better, but first to finish this bike.